Today, Roma communities worldwide celebrate the 25th International Roma Day. Although officially adopted in 1990 at the 4th Congress of the International Romani Union, the celebration also echoes the first major gathering of Roma leaders, in London, in April 1971. 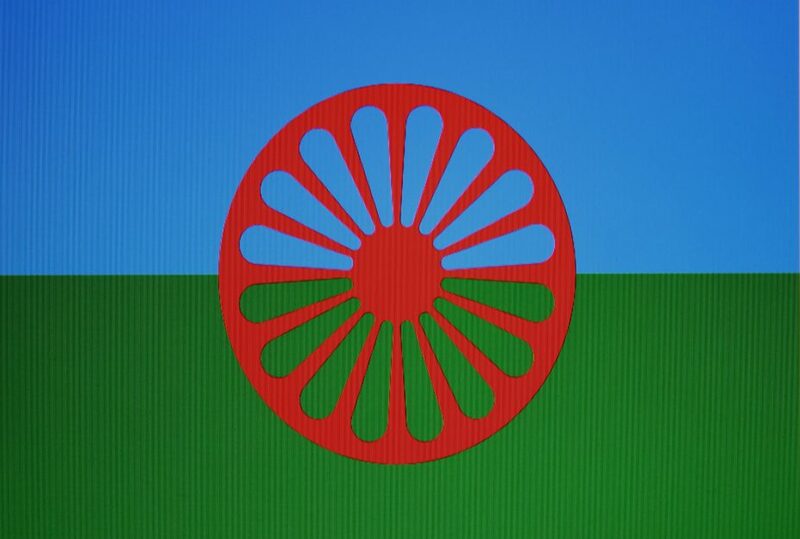 It was then that the Roma anthem and flag were adopted as the two symbols of the transnational Roma people. April 8, 2015. International Roma Day is first and foremost a celebration of Roma diversity and a commemoration of the often overlooked Roma victims of the Holocaust. When seen in the context of efforts to raise the consciousness of ethnic minorities in Europe post World War II, the establishment of this holiday marks a milestone in the Roma people’s path toward unification. Not unification inside the borders of a Roma national state, but within the framework of a geopolitical context in which the Roma would be counted as full global citizens. In 2006 Romania marked April 8 as the official day for formal “Celebration of Ethnic Roma.” The legal document that codifies this policy stipulates that institutions at both central and local levels of government that are charged with ensuring equal opportunities for all citizens, along with other governmental bodies, should support the celebration. Authorities provide varying degrees of material support, and politicians use the once yearly occasion to secure political sympathy for upcoming elections. However, these celebratory events rarely complement social inclusion measures. At the community level, many obvious indications still persist of failure to achieve social inclusion. The responsibility for this failure lies not only with local and national institutions, but also with the Roma leadership. While many local administrations have been willing to fund Roma Day events, they appear less willing to provide the co-financing needed to build infrastructure and take other measures necessary to connect Roma communities with the majority population – measures such as access to labor, housing, education and health. Weak political performance by Roma representatives has also led to the slow rate of social inclusion and to inadequate social justice outcomes. Our Roma political advocates seem to lack the capacity to join their efforts in a constructive way, so that we can give birth to a new universe for the millions of ignes fatui. When it comes to elections, there are of course cases where a Roma majority would easily prevail to bring about a certain goal, but these cases are the exception. More broadly, at national level, lack of political will has translated into poor implementation of the Romanian government’s strategy for improving the situation of the Roma since the early 2000s. Romanian politicians and bureaucrats have failed to allocate financial resources and propose implementation methodologies to fulfill their political commitment to the European Union – a commitment taken to appease the union prior to and after Romania’s accession. One of the main reasons policymakers have failed is that they do not ask the Roma people what they need. For example, far too many politicians and experts point to limited enrollment to education as the root of all problems faced by the Roma. While access to education is an actual problem, claiming that this is at the root of Roma exclusion is to suggest that this otherwise well-integrated ethnic minority has simply chosen to defy reason by waging a multigenerational boycott against school attendance, willfully aiming for a life of poverty and social exclusion. Moreover, mere enrollment in primary school is not necessarily part and parcel of any package that includes quality education, desegregation measures, or intercultural education. While endorsing Roma enrollment in primary school, policymakers have not hesitated to enforce social exclusion by physically separating the Roma from the rest of the population. Residential segregation, which places Roma in peripheral areas miles away from non-Roma neighborhoods, has denied the Roma people access to quality education, proper housing and health services. And, to make doubly sure the Roma people are kept away from the majority population, some mayors, such as the mayor of Baia Mare, have literally hidden Roma neighborhoods behind actual walls. Nevertheless, there have been some efficient initiatives undertaken by civil society and by some governmental institutions. These initiatives emphasize an integrated approach to delivering services, in order to better ensure smooth and sustainable development. But in the long term, real political will is necessary, especially at the local level, to support and ensure resources for the sustainability of such projects. Romania’s 2015 Roma strategy needs to be genuinely supported by the government. The strategy’s four priority domains — labor market, housing, education and health — must be properly sustained and financed by state institutions. Even more, the European Commission’s support is essential, as Brussels will most probably determine the financial allocations, monitoring mechanisms, ongoing policy evaluation, and the overall progress of implementation. Finally, although racist political and media campaigns, alongside ethnic profiling (police registries based on ethnicity), are a day-to-day Roma reality, hopefully the new national and international commitments regarding the Roma minority will steer European society toward finally treating their Roma fellow citizens as more than romantic clichés – nomads, dancers, singers, thieves or human traffickers. Georgian Lunca is a Roma activist and blogger on social justice based in Romania.